OVEN BAKED RIBS are just sooo tasty. I like cooking ribs in the oven because it's super easy and they turn out so moist. They're also great for rainy days when you don't have access to your grill. These dry rubbed ribs are one of our favorite easy dinners for summer. 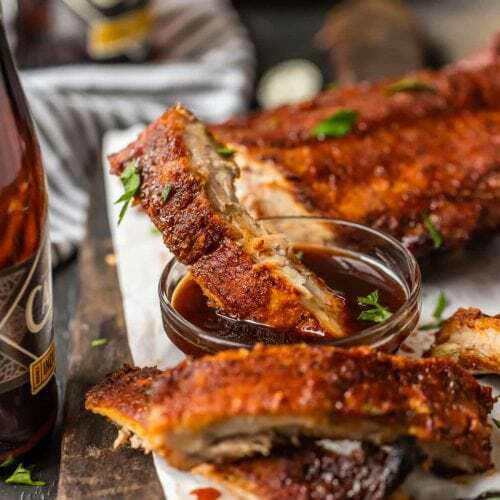 So kick your BBQ skills up a notch with these Easy Oven Baked Ribs, whether you're making spare ribs or baby back ribs! Either way, you're left with SO MUCH FLAVOR! ½ cup barbecue sauce Blue’s Hog BBQ Sauce is my favorite. Line a baking sheet with double layers of aluminum foil and set a cooling rack inside the pan. The rack allows for heat to circulate evenly on all sides of the ribs. Place the ribs on the rack. In a large bowl, combine all dry rub ingredients and whisk well until all ingredients are completely incorporated. Set aside 1 cup of dry rub and place the remainder in an airtight container/jar to save for later use. In a small bowl, mix the mustard and the liquid smoke. Brush a thin layer of the mustard/liquid smoke mixture over both sides of the ribs. Sprinkle the dry rub over the mustard and pat it gently so the rub will adhere to the meat. If desired, the seasoned meat can sit overnight in the fridge, just be sure to cover the pan tightly with foil. When ready to cook the ribs, set the oven to broil and place the pan on the top rack of the oven. Broil the ribs (watching closely) for 4-5 minutes or until the dry rub sugar is bubbling and ribs are browned. Remove the ribs from the oven and set the oven to 300 degrees F. Move the oven rack to the middle position of the oven. Once the oven has heated to 300 degrees F, place the pan of ribs (uncovered) in the oven. If cooking Baby Back Ribs, roast the ribs for 1½-2 hours. If cooking Spare Ribs, roast for 2½-3 hours. Halfway through cooking, cover the ribs with aluminum foil to keep them from getting dry. After the ribs have cooked with only 30 minutes left, brush the ribs lightly with barbecue sauce. Cover with foil and cook until the ribs are fork tender when tested in the thickest part of the ribs. Allow the ribs to rest, covered for 15 minutes. To serve, cut between the bones to separate into individual ribs. Serve with extra barbecue sauce or your favorite dipping sauce.